Knowing the days of the week, months of the year, and seasons will come in handy when traveling, making plans with friends, talking about history, and lots more. Click to listen to these sound files. The French week starts on Monday. French days of the week are not capitalized. On peut aller au ciné vendredi. We could go to the movies on Friday. Je ne travaille pas lundi. I’m not working (this) Monday. On va au ciné le vendredi. We go to the movies on Fridays. Je ne travaille pas le lundi. I don’t work on Mondays. French months are not capitalized either. Mon anniversaire est en septembre. My birthday is in September. Nous allons voyager en avril. We’re going to travel in April. 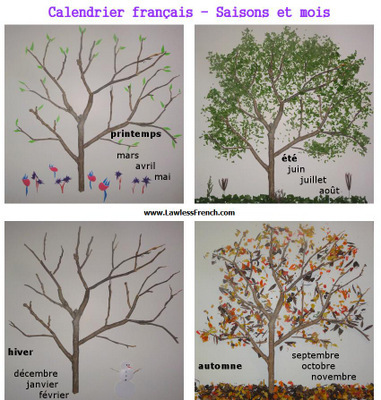 All French calendar words – days, months, seasons – are masculine. 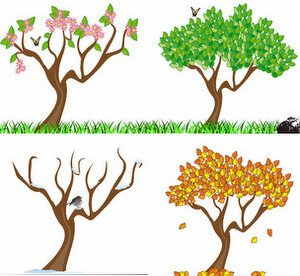 Il fait beau au printemps. The weather is nice in the spring. Je ne voyage jamais en hiver. I never travel in the winter. Reread this lesson from the Dates lesson. I also changed my computer calendar, a short while ago, to start with the option of Mondays . Took a little getting used to, but now it makes much more sense to have the two days of le week-end together, instead of split by the weekdays. I’m guessing the French adopted the phrase week-end, but they made better use of the concept in their calendar layouts. Thanks, Like always nice, easy, short and useful .